European elections 2019: can the SPD recover ? After the SPD’s historically low result in the November 2017 federal elections, the German Social Democrats entrusted the analysis of the defeat to a commission of 5 experts, who presented their more than 100 pages strong report Aus Fehlern lernen (‘learning from errors’) to the public in June 2018. 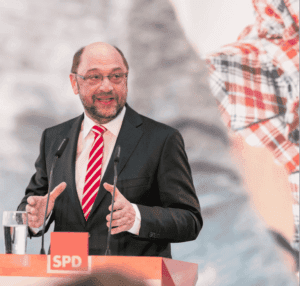 Amongst the cardinal mistakes, the report mentions the late appointment of the SPD’s candidate Martin Schulz, but it also examines the meaning of the short-term boost Schulz’s appointment triggered in the polls. Jana Faus is one of the authors of the report. In early 2017, Germans were open to a new chancellor, but they were not really tired of Angela Merkel, especially as most voters could not see any major difference between Merkel’s CDU and Schulz’s SPD. After Martin Schulz’s nomination as the Social Democrat’s top candidate to run against Merkel, polling figures for the SPD went up dramatically. Suddenly, the chancellery seemed within reach for the SPD. But this flicker of hope did not last long, due, mainly, to a great many home-made mistakes. However, the short-term boost in polling figures for the SPD can be read as a proof that voters are still open – even if not hungry – for social democracy. It is worth having a closer look at those voters who considered voting SPD when they felt the right candidate was running for office. The short-term boost in polling figures for the SPD can be read as a proof that voters are still open – even if not hungry – for social democracy. Who are the progressive voters? In this particular moment, the SPD gained potential voters across all social groups. Clearly, there is an untapped potential lying dormant for social democracy. Particularly women, voters with a higher formal education and younger voters seemed open to voting for a progressive party. Mainly two groups could be identified within this potential: firstly, unaffiliated voters without party ID who saw Martin Schulz and the SPD as a reliable alternative to chancellor Merkel and her Christian-democratic party, and secondly progressive voters who wanted to support Merkel’s refugee policy against right- wing attacks without wanting to vote for her party, the CDU. Those voters share a value system that emphasises democratic accomplishments, human rights and liberties. They support open borders within the European Union, feel an imperative to help people in need, are concerned about the social coherence of society and believe that the open society in the European Union is under threat. However, they do see issues and challenges that come with a changing society: social inequality is increasing and solidarity between the different European countries is badly damaged. They believe that challenges like the refugee crisis need European and not national solutions. At the same time, they fear that certain countries – Germany in the first instance – are carrying too much financial responsibility compared to other countries. They are concerned that economically strong western European countries may be forced (again) to bail out countries in Europe’s east and south. Underneath this perception lies the fear of losing out when resources are distributed. Progressive parties in Europe urgently need to make clear why the European Union is more than a huge bureaucracy. How can those voters be addressed? Progressive parties always face a singular struggle: how to get out the vote? Mobilising supporters is always easier for conservative parties as their voters have a higher propensity to vote. Mobilisation needs some kind of emotional ‘branding’ that must either be driven by a significant individual conviction or the feeling that every single vote counts. Progressive parties in Europe urgently need to make clear why the European Union is more than a huge bureaucracy, that democratic and liberal values are under enormous threat and the next election to the European Parliament has the potential to change the future – for the better or for the worse. With Brexit approaching, they need to emphasise that member countries would be worse off without the EU and that the block is under real threat. Progressive parties are well advised to demonstrate that democracy and liberal values cannot be taken for granted but that it is in the voters’ hands to secure the future of an open society in Europe.